Club Penguin Cheats by Mimo777 Club Penguin Cheats by Mimo777: Club Penguin Hidden Bumper Car Sneak Peek Video! 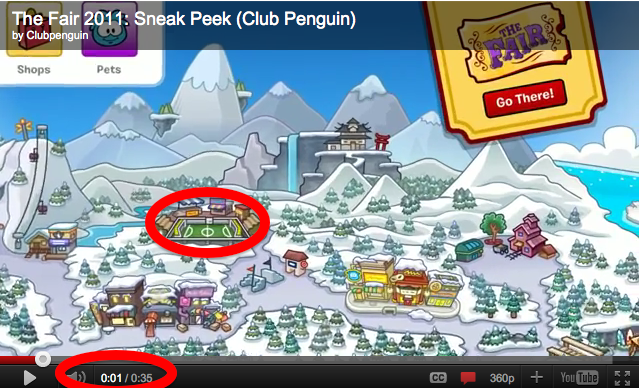 Club Penguin has done the coolest cheat eva! In the video they posted yesterday, as a sneak peek for The Fair, there is a hidden link IN THE VIDEO!! And you get this hidden video! Awesome, huh? Thanks Club Penguin for giving us this super sweet cheat! Thanks for the credits! I'm really exited about it! I am happy to help! The name is in hebrew and it means: Club Penguin Cheats. that name is from a site that me and my friend made and lasted for a day...LOL! did you go to the nightclub? well.. it is playing the island adventure party! maybe show that on your website. Want to know how to write mimo777 in hebrew? Did you noticed that the sports catolog hasn't been updated since May? Wow! Hey Mimo! Did you know that in the Bumper Car video Billybob and some guy called Tour Guide. Weird! Now on the homescreen , where's herbert?? Did you notice the RED car? Mimo! The red car happy's wearing will be in the members prize booth. you can see it in the fair sneek peak video, pause just before happy walks into the circus.